Well, that was fast. Not eight days after Apple’s new flagship store was unveiled, Stevie J.’s fantastical glass elevator began acting a bit wonky, first opening and shutting its doors, then finally sealing in its passengers on the upper level. Apple store employees worked their hardest to release the bunch, but eventually the NYPD had to be called; the elevator’s hydraulic system had to be drained, and the confined group was let out in the store’s bowels (i.e. lower level). 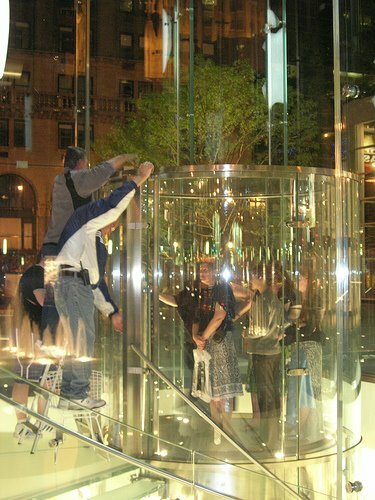 Everybody otherwise seemed okay, but as far as we know, no one was gifted with a free iPod in exchange for the 45 minutes they spent trapped, encased in glass like so many specimens for study.